An artiste who disappeared from the limelight in 1966, returned last week to sing to a capacity audience at the California's Soul City - and was voted a great hit. 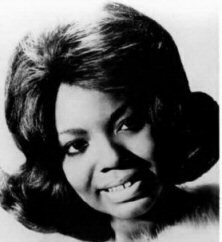 Mary Wells, whose single "My Guy" from 1964 was re-released recently and is currently storming the charts, sang her own brand of soul and Motown based numbers on Saturday night. Bruce Benson, Soul City's own top DJ, who comperes the big names every Saturday and who currently tours with BBC DJ Johnny Walker said: "Mary is now 32 and is hoping to make a big comeback. He added that her road manager was Jimmy Ruffin and this in itself was a good sign for her future." This Saturday Gary Glitter tops the bill. His single "Rock & Roll Parts I & II" is still in the charts after many successful weeks. Mary subsequently gave up singing after contracting cancer of the larynx. She died in 1992.